Offer 41 different vacation trips to and through the beautiful Canadian Pacific Rockies. Fares range from $13.70 to $56.55. Back-East Tours including through the Arrowhead Lakes, Lake Louise, Banff, etc. 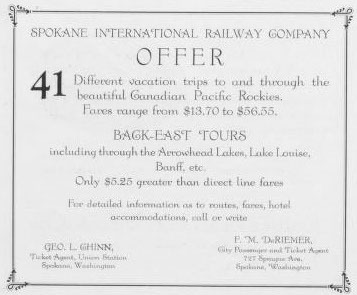 Only $5.25 greater than direct line fares. For detailed information as to routes, fares, hotel accommodations, call or write Geo L. Ghinn, ticket agent. Em.M. DeRiemer, City postmaster and ticket agent, 727 Sprague Avenue, Spokane, WA.